this john doe suit was filed on 11 september 2013. interestingly is that it is only the second such suit filed in the 9th jdc and about a week after the first one, daniel slayter vs john doe docket no. 248272 -- which should be available online before long. 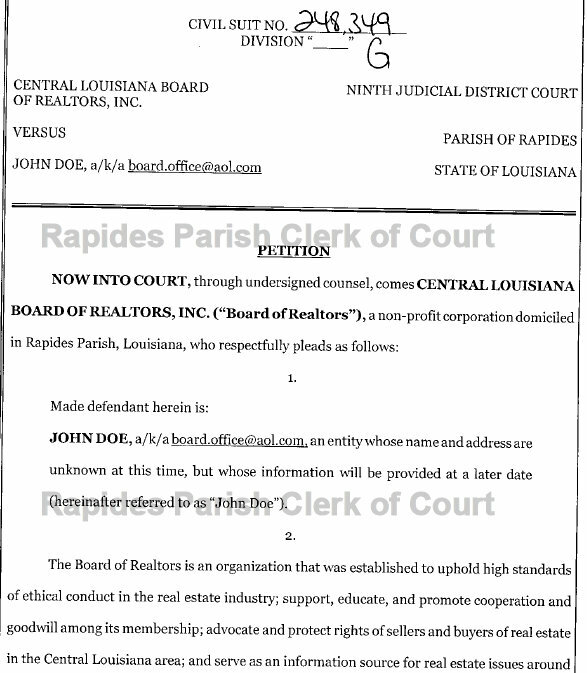 the petition, which is unverified, is filed by mark f. vilar, esq., of alexandria's vilar and elliot law firm on behalf of the central louisiana board of realtors claims that someone using the aol email address of board.office@aol.com and on 02 august 2013, "john doe sent an email message to the members of the board of realtors that contained disparaging and embarrassing information about a member of its board of directors." 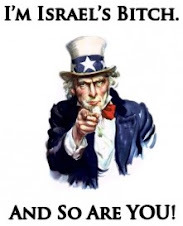 note: the board of directors email addresses are publicly available. 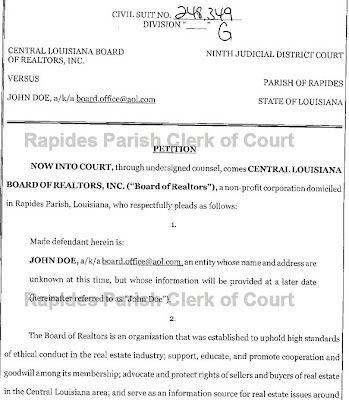 what's interesting is that nowhere in the petition is a claim stated for defamation or that the 'embarrassing information' about a board member isnt true -- just that the email address was created for the purpose of appearing to be an official email address and that "the board of directors does not know the identity of the person(s) who accessed its database and the membership mailing list and who sent the email message..."
that argument seems pretty flimsy. we bet that whoever sent the email message is a member of the board of realtors and already had everyone's email address. sure, it appears that the board.office@aol.com is an anonymous type email address, though not likely spam. also, no copy of the email in question was entered into the record as an exhibit. the absence of the email tends to lead us to believe that its contents might be somewhat credible or believable and not the work of a hacker. plus no subpoenas as of the date and time of this post seeking information have been filed to aol either. it's too late to catch rod noles today but someone should call his ksyl real estate talk show next wednesday and ask him what its all about. the case is allotted to ninth judicial district court judge harry f. randow.